Inside is a straightforward free first person horror game that cuts to the chase – the player is trapped inside some kind of monastery and has to escape. 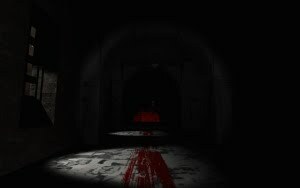 The hallways are covered in near complete darkness with only some flashes of light from the windows and, more disturbingly, of blood red from corpses and a supernatural blood fountain. Luckily we have a flashlight (‘F’ key) to help us. The only way to escape is to find the key to the roof and open the door to alleged safety. The key is located in one of the several crates spread through the rooms, but remember to press ‘E’ next to a crate to confirm if it is empty or not.Although initially everything is eerie and silent, turns out we’re not alone and some mysterious creatures are stalking us. Inside doesn’t have enemies per se and it’s impossible for the player to die. However, the author relied a bit too much in jump scares, spawning creatures right in front of us with a loud sound effect to make us jump. Cheap tactics, perhaps, but they’re incredibly effective if you’re playing at night and with headphones. The heavy breathing from our frightened character is very realistic and could almost reflect our own at some places.Inside could be so much more if the pace was better thought-out. There’s really isn’t a sense of ramping up from the initial tension and the whole adventure has a mild tempo to it that could benefit from a more exciting endgame. The end twist is interesting, though, if extremely short.For fans of bloodcurdling adventures and jump scares, Inside is a great freeware horror game that won’t take more than half an hour to finish. Although far from original or surprising, it’s an effective little game that deserves some attention from players who like their Slender, Which and Candles.